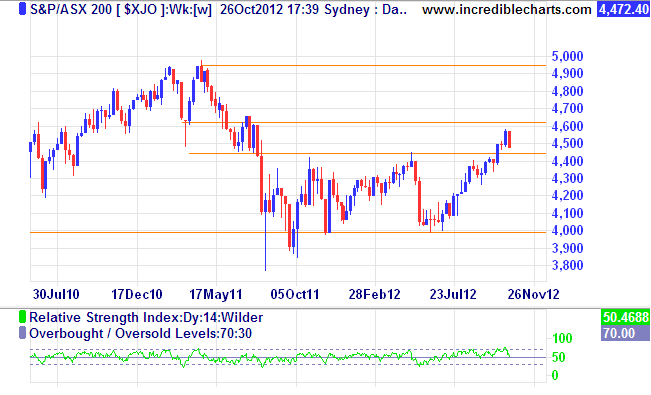 The XJO declined abruptly this last week by 87 points (4559 to 4472), and in doing so the RSI indicator fell back from an “overbought” level above 70, to 50, a mid-range position. Down days on Monday, Wednesday and Friday were responsible for the fall which still ended 22 points above the support line of 4450 evident on the weekly chart. My expectation would be for the balance to tip back to renewed buying, after this period of profit taking, but there are two chart features which cast some doubt that this will eventuate. 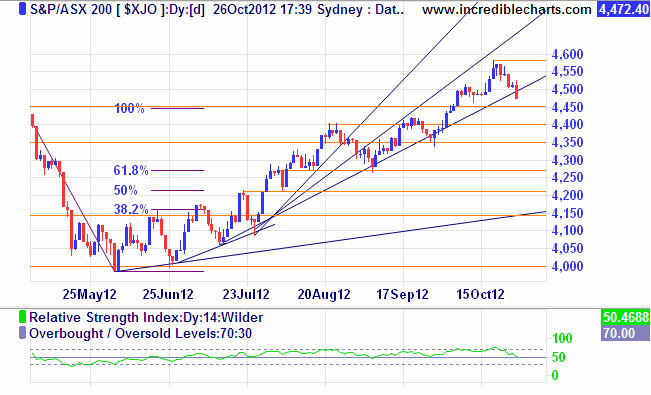 Friday’s candle penetrated down through the lower of three trend support lines; after a 4 month bullish move from 4000. The more likely alternative I think is for the up-trending momentum to resume next week with the index possibly forming a new high in the vicinity of 4600.